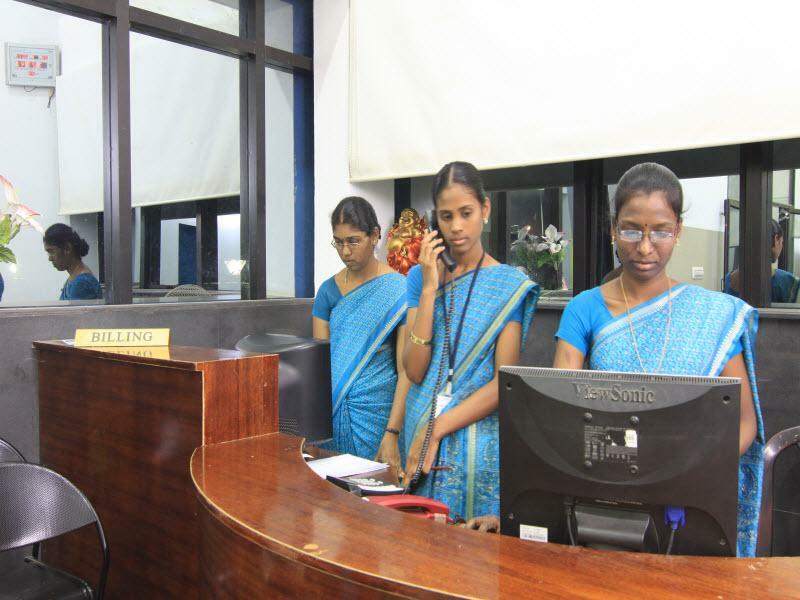 The Front Office manned by efficient staffs is equipped with synchronized central computers to retrieve outpatient and inpatient details rapidly. The front office fixes up appointment for all consultants and also intimates the appropriate consultants in case of emergencies. 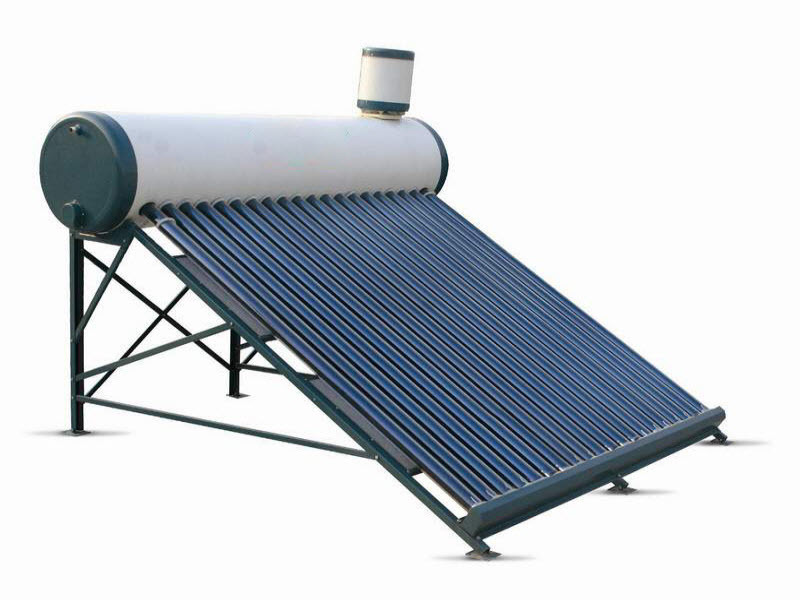 It also handles the travel requirements of patients and others alike. The Out-Patient department has a cozy and comfortable waiting area with good ventilation and piped music around the clock to soothe the nerves. The OPD facility functions around the clock with all-time availability of medical and para-medical staffs. All patient details are registered in the synchronized computer data bank and manual record of same is also maintained. Retrieval of OP case sheets during review consultations is made easier by the unique MRD number provided to each patient. Patients are triaged based on the severity of symptoms in the OPD. 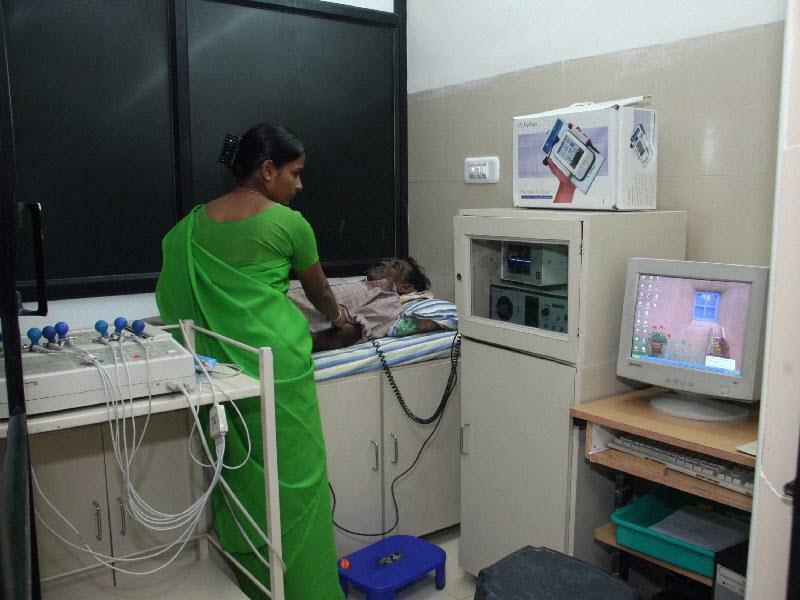 All patients are weighed and checked for blood pressure, pulse rate, temperature (if necessary) in the OPD and the details are recorded in the OPD case sheet as well as in the computer data bank. All patients are provided with complimentary refreshments around 11 am as well as when their waiting period is expected to be long. Prior to the consultation with the medical officers, patients are met by the dieticians and counselors and their dietary habits and chief complaints are recorded. After consultation by the medical officer, all patients meet the counselors / dieticians again for advise on dietary habits, exercise, methods of using any health aid devices, and correct usage of prescribed medicines. The In-Patient departmentThe hospital has a total of 30 beds. Each bed is provided with a locker and backrest. A common toilet / bathroom with wash serve them. Common toilets / bathroom with wash serve these rooms. Each bed is provided with individual light, screen and lockers. All rooms are provided with attached toilet / baths, cupboards, tables and attender cot. In house telephone and emergency nurse call system is available in all rooms. Deluxe room is provided with Air - Conditioner. The deluxe room also contains attendant side-couch, attached toilet / bath with wash, telephone, cupboards, television and a work table. Intensive Care Unit, an integral part of the hospital, off limit to casual visitors, is equipped with latest machineries to combat emergencies. The Intensive Care is 3 bedded . 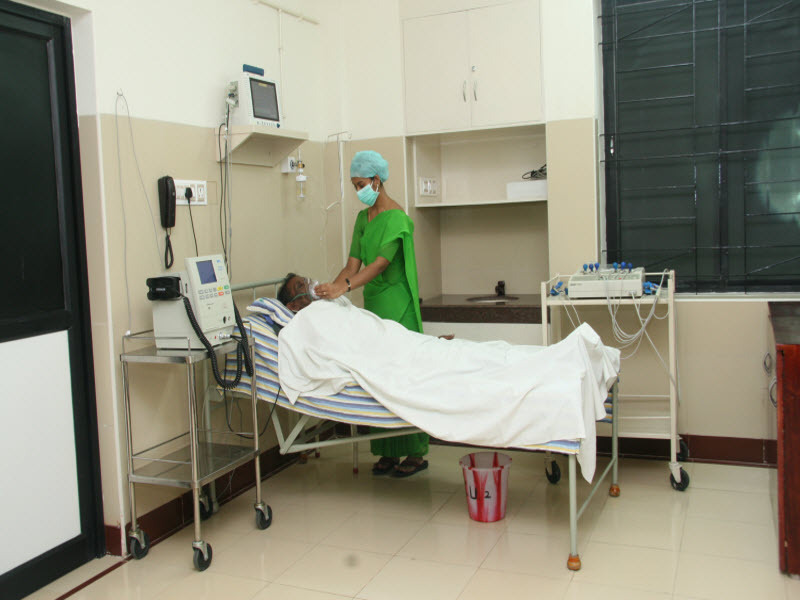 The Intensive Care unit is also equipped with a Color Echocardiogram 'GE Logiq PRO3' machine exclusively used by the Cardiologist, Dr. Sukumar, MD, DM for early diagnosis of life threatening diseases like myocardial infarction, pericardial tamponade.. 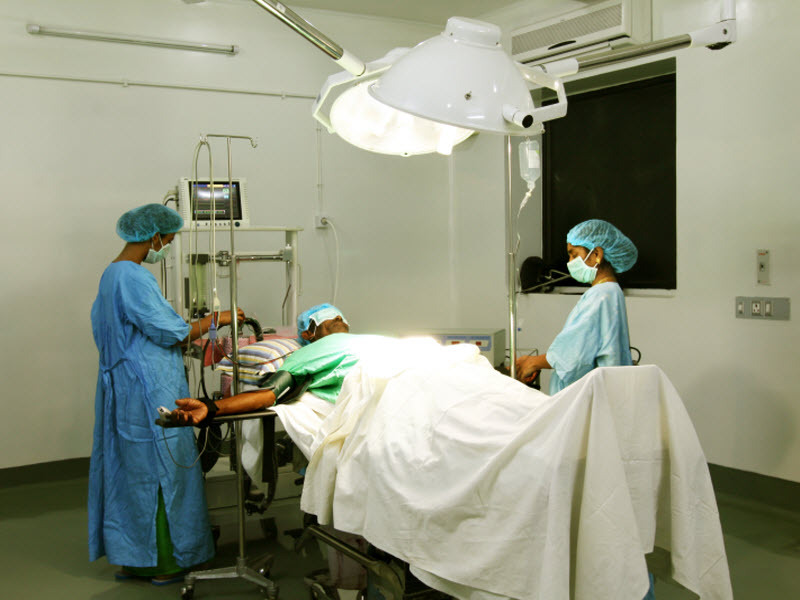 The State-of-art Operation Theatre complex includes a Major Operation Theatre , Minor Operation Theatre and Special Procedure Room. Amputations of toes / fingers - for diabetic gangrene. Circumcision for phimosis or recurrent balanoposthitis. India has the dubious distinction of being the world leader in the prevalence of diabetes mellitus. In diabetics, amputation is a dreaded complication. Today in the world, every 30 seconds, an amputation is being performed and of these amputations 85% are preventable. So in order to detect the risk of foot ulcers at the earliest, we have a state-of-art Diabetic Foot Care Centre. Diabetic peripheral neuropathy is one another important precursor of diabetic foot ulcers. Patients who are affected with the peripheral neuropathy are immune to all sensations, which means they cannot feel hot/cold, touch, pain in their affected limbs leading to repeated trauma and thereby ulcers. Vibration sense is the first sense to be affected in diabetic neuropathy and Biothesiometer, helps in identifying the loss of this sensation and thereby identifies at risk foot at the earliest. Autonomic neuropathy is an important precursor of rhythm abnormalities in heart, gastrointestinal symptoms like diarrhea, constipation as well as heel fissures and loss of sweat in foot. Ansiscope identifies the autonomic neuropathy at it's earliest phase and can help in prevention of these complications. Mechanical trauma and thereby ulcer occurs due to uneven weight distribution in structurally altered feet. The undue pressure points can be identified by the Harris mat and thereby foot wear can be customized to offload pressure from pressure points in feet. Monofilaments to detect loss of touch sensation in foot at the earliest. Touch sense is another sense crucial for prevention of diabetic foot ulcers. Monofilaments help in assessing the presence of touch sensation in different parts of the feet, so that the level of diabetic peripheral neuropathy can be assessed and necessary precautions can be initiated. The Biochemical department is under External Quality Control by Department of Biochemistry, Christian Mission Hospital, Vellore. The facilities available in the laboratory are Biosystem's fully Automated Biochemical Analyzer, Secomam Semi Auto-analyzer, Siemens Elisa Reader, Electrolyte Analyzer, Automated Centrifuge, Microscope, Autoclave. 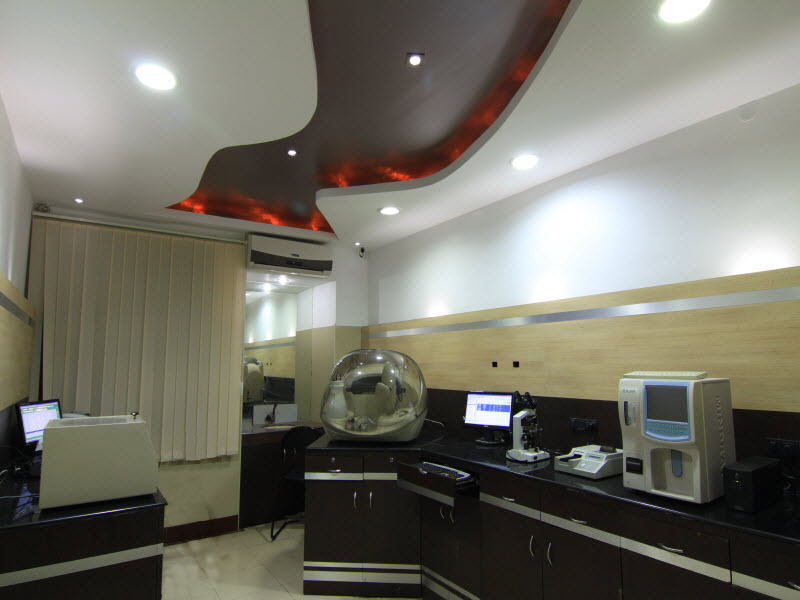 All laboratory reagents are maintained as per standard and only the reagents of top most quality used. Specialized tests like HbA1c, Fructosamine, Urine Microalbuminuria, Thyroid Profile, IgM & IgG AntiTB assay, CRP are being done with qualified and highly experienced technicians. The hospital also has 6 Glucometers for blood sugar estimation during emergencies and for in-patients. The Microbiological department equipped with Laminar Airflow, Anaerobic cell culture facility, Olympus Binocular microscope takes care of culture and antibiotic sensitivity assay of pus, urine, blood and other body fluids. The microbiology department is headed by Assistant Professor of Microbiology, Dr.Amuthan, Ph.D. The Haematology department under External Quality Control by Department of Haematology, AIIMS, New Delhi is equipped with Mindray 4-part Automated Cell counter, the first of its kind in the district. Reports are laser printed in a standard format and also stored in electronic format for future research and analysis. 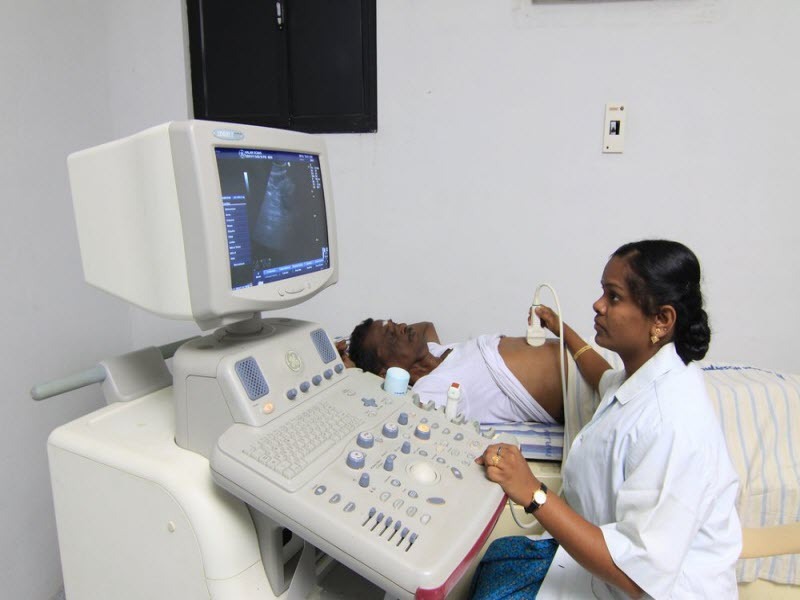 Echocardiogram is done by Dr.P.Sukumar, MD, DM, senior cardiologist as well as by Dr.Sankarkumar, MD, D.Echo. 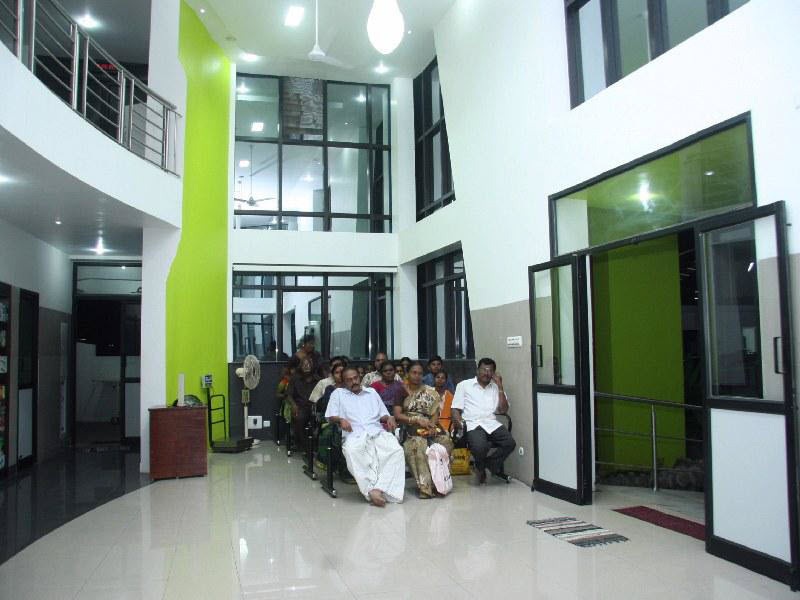 Nalam Connect, a first time of its kind telemedicine centre for diabetes, is opened by Nalam Hospital at Aundipatti, a small town at a distance of about 16kms from Theni on 07th September 2011. Diabetes mellitus the greatest masquerader of all diseases has its major impact on health due to its complications. The major reasons for complications are delay in diagnosis and lack of regular follow up. Digitalization of laboratory reports, ECG report and prescriptions. A well equipped clinical laboratory for basic biochemistry and hematology assay. 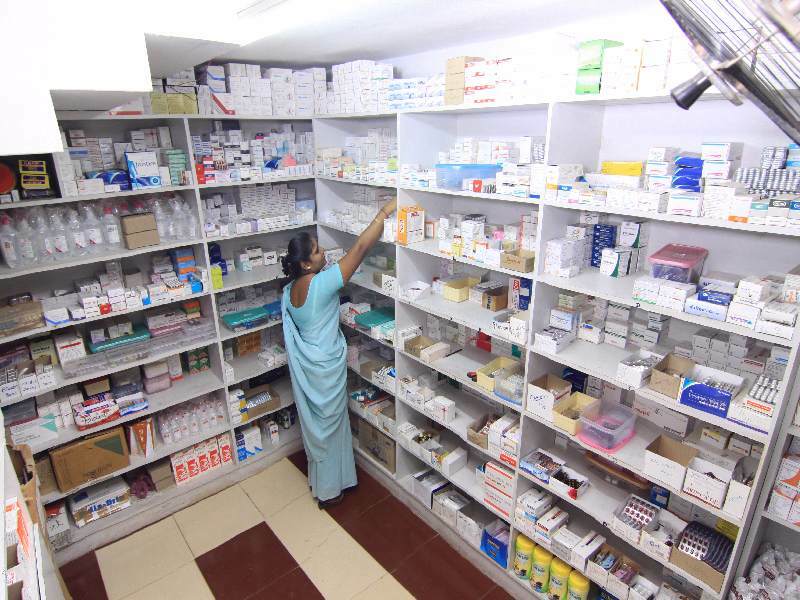 A well stocked air-conditioned pharmacy manned by qualified and experienced pharmacists, drug dispensers and computer operators functions round the clock. The quality and quantity of the medicines stocked is routinely reviewed by the administrative department of the hospital. The pharmacy strictly adheres to the rules and regulations of the Drug Control of India. Over the counter sales is strictly prohibited. A counselor ensures that the patients have received the prescribed medications, instructs them on the proper usage of medicines prescribed as well as clarifies doubts if any. Dia Shoppe, a unit of Nalam Pharmacy deals exclusively with diabetes related products like Glucometers, Insulin devices, diabetic foot wear, custom designed foot supports, diabetes specific food stuffs like jam, biscuits, other confectionaries, health mix, drinks and juices. A round the clock cafeteria serves both hospital staffs as well as patients. 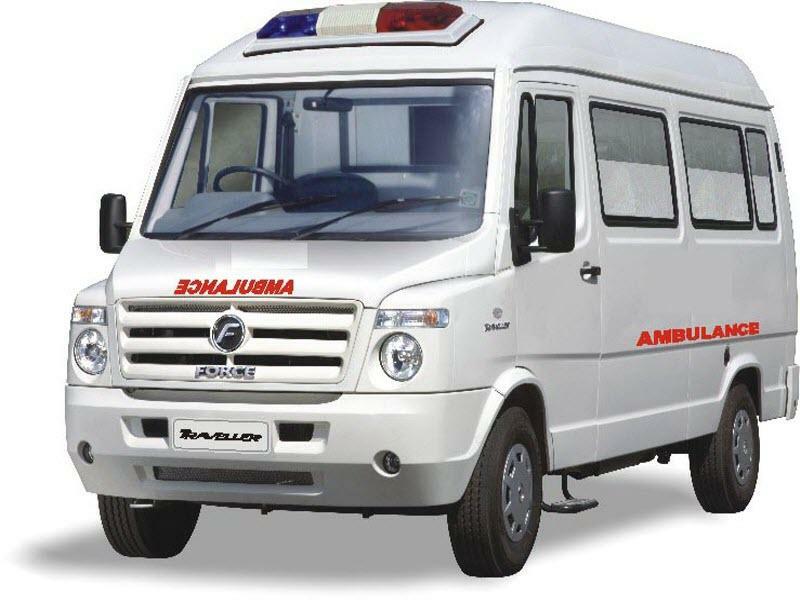 Nalam hospital uses the service of more than 2 private ambulance operators to receive emergency cases from distance places and to shift cases for specialized care in case of necessity. © Nalam Hospital. All rights reserved.